To complete the bank reconciliation you will need to compare the transaction in your cash book to the transaction on your bank statements. Any differences need to be recorded in a bank statement reconciliation. It worth trying to complete your reconciliation regularly on a monthly basis, when your statement is available. 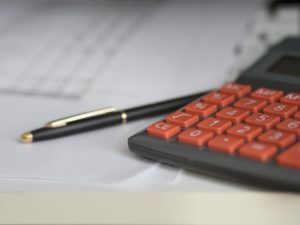 Why is bank reconciliation important? By comparing your bank statement to the cash book you will ensure that all your transactions have been posted to the cash book and also that all your bank transactions have been completed. There may also be items on your statement which will only be picked up by checking them; these include bank charges, interest and payments which are made on direct debit or standing order. Any errors which have been made in the statement period will also can be found and corrected. These errors may be writing amounts down incorrectly in the cash book. A bank reconciliation worksheet will show the differences between the bank statement and the cash book. Some of these differences may just be timing differences; this is especially the case near the statement end date. Timing differences can occur for the following reasons: time involved in post, payments can take several days to clear the bank and banking receipts which were completed after the close off time. Here is an example of an Excel bank reconciliation statement. You will need to check off (tick) any payments and receipts which appear in both the cash book and bank statement. Make any amendments to the cash book as required. These are items which appear on the bank statement, but are different or missing from the cash book. On the Bank reconciliation statement list any payments made which have not been cleared. List any payments received which have not been cleared. Fill in the totals from the cash book and bank statement on to the reconciliation statement. When all this has been completed the balance at the bank should equal the reconciled balance. If there is any difference check through again it is sometimes easy to miss small mistakes. It is sometimes useful to work out how much the difference is so it is easier to track down. To do this take the balance from the reconciled statement and deduct the balance as per the bank. 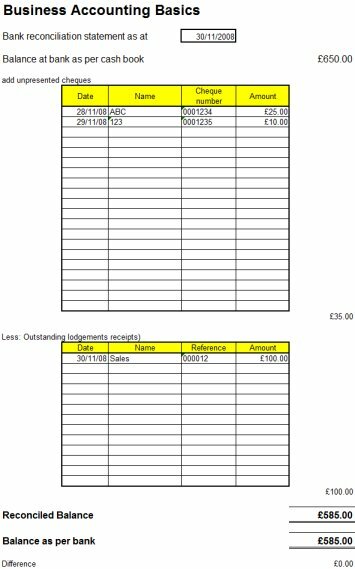 We have produced a free Excel bank reconciliation worksheet which you can download and use free of charge. By downloading the template you agree to our licence agreement. Return from bank reconciliation to bookkeeping basics page.